Beware, bears! 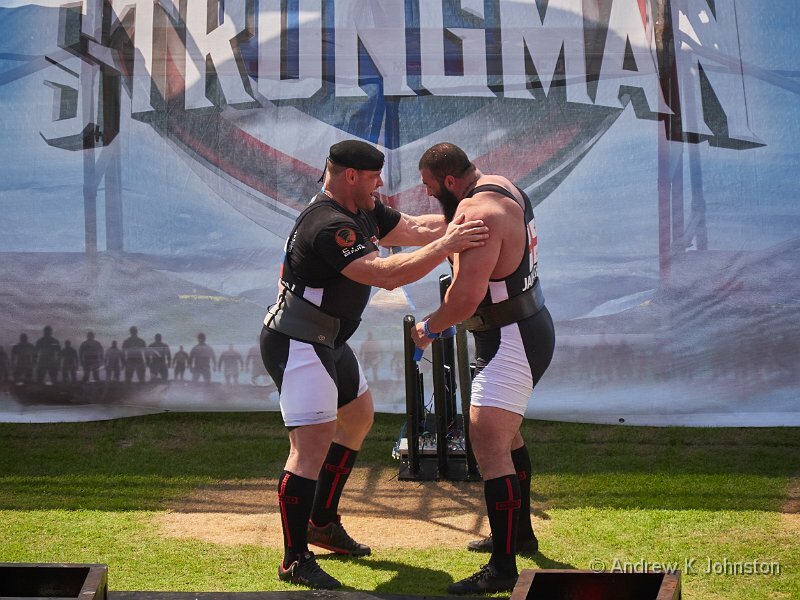 Russian strongman and former commando Mikhail Shivlyakov “psychs up” friend and fellow competitor Konstantina Janashia from Georgia, ready for a successful 480kg deadlift. This article was also published as a guest article on "The Online Photographer". My Panasonic GX8 arrived pretty much on the day of official availability and has been my primary camera for almost three years, including two major photographic trips, and innumerable other opportunities in between. It improved on the already good GX7 with "just right" sizing, a better sensor and higher speeds. Like many other owners and fans I was looking forward to a fairly straight replacement – all Panasonic had to do was fix the awkward exposure compensation control and improve the action autofocus and it would be pretty much perfect. Fat chance. Instead, and not for the first time, Panasonic have shaken up the Lumix G range, with the GX9 effectively moving down the range, and all the new goodness going into a new "stills flagship" the G9, which sits at the top alongside the video-centric GH5 and its variants. After a bit of prevarication, I decided that I was due an upgrade, and plumped for the G9. My new camera arrived a few days ago. This review is based on the first few days’ moderately heavy use. It’s not meant to be a comprehensive, or dispassionate blow-by-blow review, but a set of personal impressions from a long-standing Panasonic user and fan. At first the G9 looks like quite a different camera, larger and more expensive, and more of a "DSLR ethos" than the rangefinder-style GX8. I’ll come back to cost, but the size issue is deceptive: put the two cameras side by side and it’s clear that the only real difference is the G9’s DSLR "hump", and a slightly deeper grip, which is academic unless you use a very small pancake lens. Given that similarity it’s surprising that the G9 is a significant 171g (about 6oz) heavier. The camera offers better weatherproofing and a bigger battery, and does feel a bit more rugged, so that’s acceptable. Unlike its predecessor, but like my old Canon 7D, it feels like it might take the odd knock without problems. In practice, you get used to the weight quite quickly. Like every new flagship camera the G9 is initially priced high, but this gives Panasonic and their dealers some room for manoeuvre with discounts, trade-ins and freebies. Depending on how you look at it my G9 cost me only about 2/3 of the advertised price, or the 5 year lifetime cost of my old GX7 net of trade-in was about £250. I can live with that. Back in early 2016 I wrote an open letter to Panasonic regarding the GX8, acknowledging its good points, but identifying opportunities to improve the ergonomics and usefully extend its stills capability. They clearly ignored the letter for the GX9, but either great minds think alike, or it did influence the G9. Ergonomically, I am a fan of "electronic" control, by which I mean the ability to set camera functions fluidly between on-camera buttons and wheels including your choice of programmable controls, the menu system, and stored custom values. By contrast "fixed switches" break this free control model and cannot be included in stored settings for custom shooting modes. In addition, I am short sighted and wearing my "distance" glasses the tiny markings on such controls are effectively invisible. The GX8’s exposure compensation control is a good (or should that be bad?) example of the latter. Apart from breaking my preferred control model it is also badly placed – I found that to operate it I either have to take my right hand off the camera and reach in from above, or somehow slide my thumb behind the camera, which usually results in both adjusted exposure and smeared glasses! No such problem with the G9 – you can quickly set up the camera so that the rear wheel, under the right thumb, controls the primary exposure value (aperture or shutter speed as appropriate), while the front wheel, easily in reach of the shutter finger, controls compensation. Vice-versa if you prefer. Perfect. Unfortunately, however, Panasonic have perpetuated, and even aggravated one of the GX8’s other ergonomic failings, and arguably introduced a new one! The perpetual horror is focus mode. The G9, like most of the G series, has four main modes: manual focus (’nuff said), autofocus "single" (half press the shutter button to focus, then full press to expose with that focus), "follow" (another single shot mode, but if the primary subject moves while the shutter button is half pressed, the camera refocuses), and "continuous" (aligned to the high-speed shooting modes, refocuses for each exposure). The ideal solution would be a button which toggles between the modes. That’s good enough for a lot of very good cameras. However the G9 has a switch. If you must have a switch, then surely it should have four modes? Nope. You select manual, continuous or single/follow on a three position switch, then have to dive into the menus to choose between single and follow, or the several variants of continuous. To add insult to injury, at least in the GX8 you could set the button in the middle of the focus switch to toggle between single and follow. Not on the G9, at least not with its initial firmware – this is set to AE/AF lock (which I personally never, ever use) and not programmable. The obvious fix is to make that button programmable so that when in the single/follow position it toggles between the two, when in the continuous position it toggles between the various variants of that mode, and when in the manual position it does something equivalently useful like turning focus peaking (highlighting) on and off. This could be fixed in a firmware update – I will just have to write to Panasonic and cross my fingers. The other fixed switch on the G9 is for the drive mode (single, high speed, timer etc.) On the GX8 this is on a button, which is much better as you can include infrequent or situation-specific settings (like high speed mode) in appropriate custom shooting modes, and just leave the main aperture-priority settings or equivalent on single-shot, with a much reduced risk of going to take a shot and being in the wrong mode. The G9 arrangement seems like a retrograde step, but liveable. That brings us from some arguable weaknesses of the G9 onto its real strengths. It’s fast – so fast it has three high-speed modes: high (about 5FPS), super-high 1 (about 15FPS) and super-high 2 (about 20FPS). The two super-high modes also have a very useful feature for sports and wildlife photography: hold the shutter half pressed and they will continuously store a few frames (about 0.4s worth) in the buffer, and write these to the card when you press the shutter, so if you are fractionally late clicking, you don’t lose the event. The downside is that you need to use the super-high settings with caution: if you are saving RAW + large JPEG files super-high 2 will chew up your memory cards at roughly 1GByte every 1.5 seconds. Another reason why I’d prefer to lock this to a custom mode! Autofocus is much improved over the GX8, although I have to admit that my first sporting event with the new camera didn’t give it that much of a workout: in absolute terms, strongmen don’t move fast. it’s impressive to see a 150kg (330lb) man jogging with the same weight in each hand, but it’s not the harshest test of autofocus! However I can report that the G9 seems to adjust focus very quickly in continuous mode and seems to have missed relatively few shots. If there’s any pattern to the misses they tend to be the first shots of longer sequences, when I may have been moving the camera into position on the action. I’ll have to try and find something involving horses or fast cars for a better check. The other area where Panasonic seem to have listened to my prior pleas is in support for bracketed and multi-shot images. In addition to the established support for exposure bracketing (for HDR), the new camera now does focus bracketing/scanning, as well as bracketing for aperture and white balance. Intelligently, even in single-shot drive mode you can choose to have the bracket shot at high speed to minimise the effect of subject or camera movement. The focus bracketing capability is something I have been seeking for a long time, and records full RAW files, a completely separate capability from the camera’s other ability to do in-camera focus stacking or post-shot focus selection from within a 6K movie file. Bracketed photos are clearly marked in their metadata, which makes it quite easy to build a script to sort them out from the rest of a day’s shooting. 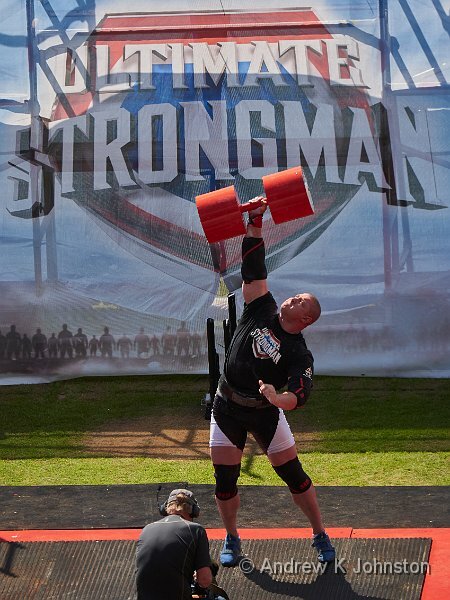 Battery life is excellent – at the aforementioned strongman competition the camera was on for most of the five hours of competition and took about 600 shots. It used one battery and was about 30% into the second, much better than the GX8 would manage. I can also confirm that the two card slot arrangement works fine, effectively doubling the memory capacity, so I wasn’t fiddling with cards. Two other ergonomic points are worth making. The rear display can be manually set to a nice bright setting for outdoors, but it’s automatic setting is far too dim. The EVF is large, detailed and bright, but as adjusted for my glasses has an odd pincushion distortion, with noticeably curved edges. This is nothing to do with the lens, which the camera corrects as required, but the way the EVF display is presented to the eyepiece. It’s not a major problem, but annoying to an inveterate picture-straightener like myself, especially as I haven’t had that problem with any of the predecessors. Otherwise it’s pretty much business as usual. Image quality appears to be just the same as the GX8, much as expected given the common sensor, and the camera has a nicely familiar feel even if some of the controls are different and it’s definitely a bit heavier. Stabilisation is at least as good as the predecessor, with no noticeable penalty from the increased weight, but it’s clear that the full multi-second goodness of "dual IS 2" will have to wait until I can afford to start replacing my lenses with the new Mark II versions. This entry was posted in Micro Four Thirds, Photography, Thoughts on the World. Bookmark the permalink.